In this Machu Picchu Photography Guide, I am going to pass on to you some tips and tricks I have discovered while photographing Machu Picchu, as well as Huayna Picchu, in my travels. I will cover some of the do’s and don’ts for photography at the site, as well as some general tips to help you come prepared. I will also discuss some of the photography tips that I have picked up, such as where to find the best shots and how to best capture this amazing landscape. Finally, I will touch on some of the equipment that I recommend you bring to Machu Picchu so that you will know what to pack in your bag when you head off for your adventure. Do not stand on any of the walls or other parts of the ruins while you are at the site. Please note that this photograph was Photoshopped and I did not break any of the rules myself. If you are going to visit Machu Picchu to take pictures, then you are going to want to make sure that you don’t violate any of the rules concerning photography while at the site. The last thing you will want is to be asked to delete your photos or be asked to leave the site because you violated a rule. So please, read this section carefully and make sure you respect the rules that are in place. While photography gear is allowed inside Machu Picchu, anything that is deemed to be “professional” photography or videography gear will require a permit (and added fee) to bring in. When I visited, I brought my Canon 5d Mark IV, as well as my Canon EF 24-105mm f/4L IS USM and Canon EF 70-200mm f/2.8L IS III USM lenses inside the ruins with no issues. I walked in with my camera around my neck with the EF 24-105mm lens attached and my 70-200mm lens in my bag. What I think will give you issues is if you have multiple camera bodies with you, any type of video stabilization gear, camcorder with an external microphone attached, a larger tripod of any type, or anything else that could be construed as professional gear. If you have a long lens, I would suggest keeping that in your bag when you enter and leave your wide angle attached to your body until you get inside the ruins. One of the rules that are strictly enforced within Machu Picchu is the prohibition of any creative photography. This means that you aren’t able to bring any props or changes of clothing with you for the purpose of photography, and you aren’t allowed to stage any scenes for your photographs. You must remember that this is a sacred site and thus should be treated with proper respect. This means that you shouldn’t be changing your clothes while inside Machu Picchu and you shouldn’t be moving things at the site to stage a photograph. Another thing you need to be aware of before visiting Machu Picchu is the bag size restrictions that Machu Picchu has. This is important if you are planning on bringing a backpack into the site to carry camera equipment or other gear. Any bag that is over 40x35x20cm will not be allowed into the site and will need to be checked at the gate. So if you are planning on bringing a bag with you, I would make sure it is smaller than these dimensions. For camera gear, I recommend the Lowepro Fastpack BP 150 AW II – A Travel-Ready Backpack. For those of you who are photography enthusiasts, you will want to pay close attention to this. Tripods are considered professional camera gear and are thus not permitted inside Machu Picchu without a proper photography/videography permit. I have read some blog posts and message board posts that seem to suggest that you can sneak a tripod in, but when I visited I witnessed first-hand someone denied bringing a large tripod into the site. Unless you want to check your valuable tripod at the gate, I would suggest not bringing a large-size tripod. Instead, if you want to bring a tripod with you, I would suggest looking at bringing something like the RetiCAM Tabletop Tripod. Tripods of this size can easily fit inside your camera bag and are less conspicuous than full-size tripods are. 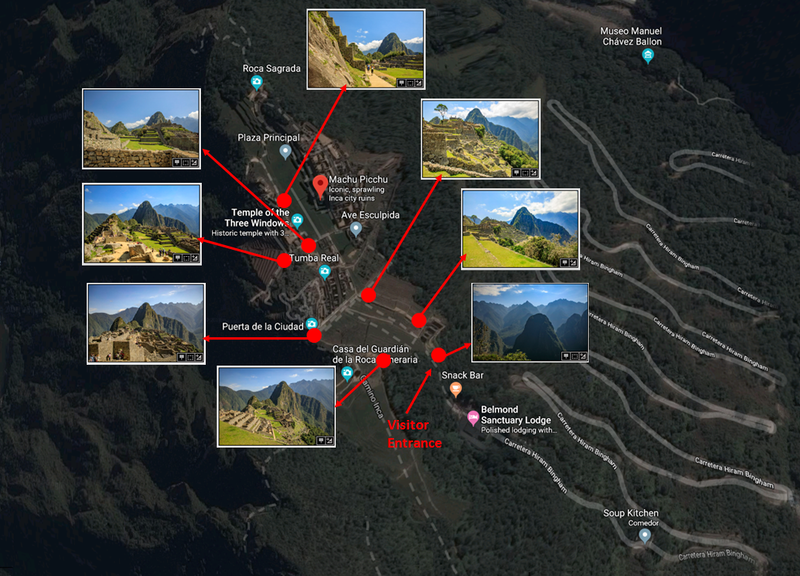 If you have thoughts about bringing a drone with you to Machu Picchu to get some killer aerial shots, this information is going to be disappointing to you. Drones are not prohibited above or near Machu Picchu. In case you are interested in Peru’s drone laws, I have included a summary of their laws below for you to review. Drones cannot be flown over large crowds. Drones cannot be flown in a way that is invasive to other’s privacy. Do not operate drones around airports or where aircraft are operating. Drones can only be flown during daylight hours during good weather conditions. Do not fly drones near sensitive government areas or military facilities. Drones cannot be flown in or around Machu Picchu or other historical sites without the proper permit obtained from the site. There is a lot of varying information regarding selfie sticks and Machu Picchu on the Internet. With the rules at Machu Picchu changing so regularly, it is hard to know exactly what is and is not permitted inside the site. However, having just gotten back from Machu Picchu this fall, I can tell you that selfie sticks are listed as prohibited items on the entry tickets to Machu Picchu. Machu Picchu has seen tourists fall to their deaths in recent years while taking selfies at the site, so it is no surprise that they are starting to ban selfie sticks. In fact, if you read your ticket closely, any self-photography in which your back is facing a ledge is prohibited at the site. This includes any selfies you take with your cell phone as well. When you visit Machu Picchu, you are going to be doing a lot of walking within the site. This includes walking up-and-down steep stone steps within the monument. You are not going to want to be lugging around a heavy bag in the heat while you do all of this walking. I would strongly suggest that you limit the gear that you bring to only the essential gear that you will need. If you are interested, I have included a list of essential photography gear for photographing Machu Picchu at the end of this article. One of the most important tips that I can give you for photographing Machu Picchu is to be patient. There are going to be crowds and the weather may not always cooperate. However, if you are patient, you can get some truly fantastic photographs. You may have to wait a while for a crowd to disperse or the cloud cover to recede, but that waiting will be worth it when you get home and see the amazing pictures you have taken. Machu Picchu is an incredibly beautiful place to photograph, which is why you see so many photographers flocking to Peru each year to get their own shots of this amazing site. That said, it can also be a challenging place to photograph if you are not prepared. To help you be prepared to take photographs when you arrive, I have included some photography tips for Machu Picchu below for you to review. One of the best pieces of advice I can give you in terms of photography tips when visiting Machu Picchu is to have a wide angle lens with you. There will be many instances where you will be up close to or in tight with the subject material that you want to photograph, and it will be nearly impossible to fully capture the subject matter unless you have a wide angle lens. This is especially important if you are using a camera that has a crop sensor instead of a full frame camera. If you aren’t familiar with the difference, a crop sensor automatically magnifies the image you are photographing by either a 1.3, 1.5 or 1.6 times magnification (depending on the camera). This magnification can have its advantages if you are trying to capture images that are far away, as the default magnification provides more “reach” for your camera. However, if you are trying to photograph objects that are up close to you, then it can have its obvious disadvantages. The difference in the field of view between a full frame camera and a camera with a 1.6 times magnification crop sensor. In the image above, I illustrate how using a full frame versus a crop sensor camera can influence the type of shots you are able to get at Machu Picchu. The image I took was with a Canon 5d Mark IV camera, which has a full frame sensor. You can see how much wider a profile the full frame camera has than a crop sensor camera such as a Canon Rebel T7i has with the same lens. I was able to capture much more of the landscape with a full frame camera than I would have been able to with a camera with a crop sensor. Now, I am not saying you need to invest in an expensive full-frame DSLR in order to be able to properly capture Machu Picchu. However, I am saying that you will need to plan ahead to make sure you have the necessary wide-angle lens, especially if you are using a camera with a crop sensor. To give you an idea of what I would recommend for a minimum focal range for different types of cameras, I have included some recommendations below for you to review. The most popular photo angle of Machu Picchu. No photography trip to Machu Picchu isn’t complete without getting one of the most popular shots you can take at the site, which is near the La Casa del Guardián at the entrance of Machu Picchu. This shot, which I have included above for you to reference, is without a doubt the most popular shot taken at Machu Picchu. In this shot, you can get the ruins as well as the beautiful peak of Huayna Picchu and the Andes mountain range in the background. This is a great opportunity to get your picture taken with the ruins in the background. The most popular picture taken at Machu Picchu can be captured near the la Casa del Guardián, which is near the visitor entrance to Machu Picchu. 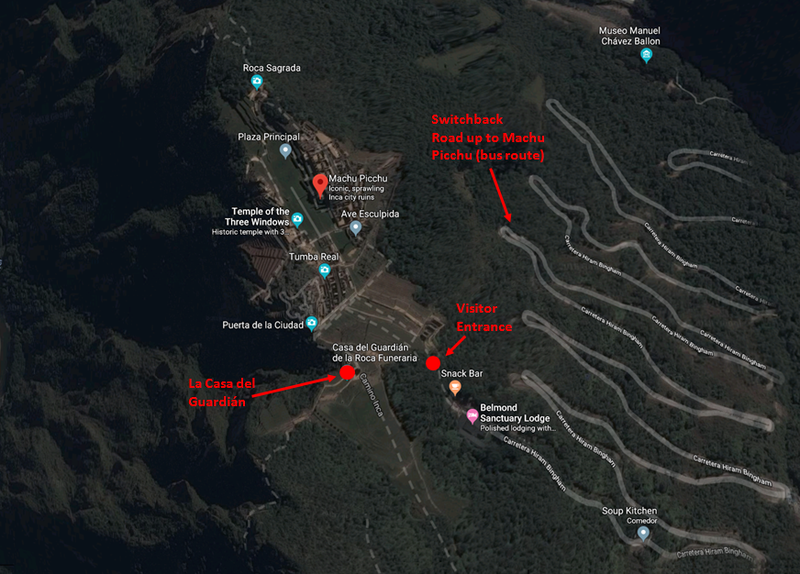 Once you enter Machu Picchu, you will want to take your first left to go up in elevation towards the Casa del Guardián, as illustrated in the detailed map I have included below. There will typically be a line of people waiting to get a shot at this location so you may have to be patient and wait for your opportunity to take pictures here. For this reason, I would suggest heading to this location immediately upon entering the site so that you have ample time to get the shots you want. Details on how to get to the most popular photography spot inside Machu Picchu. If you would like to learn more about how I planned my shots at this location, as well as how I typically research and plan my travel shots before traveling, I wrote a fairly in-depth article on my shot planning process in a previous Art of Travel Photography post. I suggest you check it out as I have found that being prepared and knowing which type of shots you want to take before you travel has helped me improve my travel photography immensely. When you are busy snapping photographs at Machu Picchu, it is easy to get fixated on the beautiful mountain peaks and the ruins and not notice some of the amazing wildlife that calls this part of the world their home. Most notable among the wildlife are the alpacas and llamas that can be found grazing on the terraces of Machu Picchu. I would suggest that you keep a lookout for these interesting and adorable creatures and try to work them into your shots when possible. They can really enhance your photographs. Just because staging photographs is prohibited at Machu Picchu, that doesn’t mean you have no creative license to use the features of the ruins and mountains to take some creative shots. When you are taking pictures at Machu Picchu, you can use the windows and doorways in the ruins, as well as walls, pathways, and the gorgeous Andes Mountains themselves to take some creative shots. For some additional inspiration, I would suggest doing a search on Pinterest and Instagram before your trip to see some of the creative shots that other travelers were able to capture during their visit. One mistake that I see people make often when I travel, and this isn’t isolated to just Machu Picchu, is to keep their camera or video camera stored away until they arrive at their destination. The area surrounding Machu Picchu is breathtakingly beautiful, and there are so many great photo opportunities you will have before you even arrive at the entrance gate. For instance, the beautiful photo of the Andes Mountains above is a photo I took before I even got to the gates of Machu Picchu. So keep that camera out during your entire journey because you never know when you will have an opportunity to capture something amazing or beautiful and you won’t want to miss it. If you are planning on hiking up Huayna Picchu, which is the mountain that can be seen behind the ruins in most pictures, then I would strongly suggest that you try and purchase a pass to hike the mountain in the morning as opposed to the afternoon. If you take a look at The Photographer’s Ephemeris (TPE) for Machu Picchu (as shown below), you will see that the peak of Huayna Picchu is the perfect location to shoot a sunrise over the ruins of Machu Picchu. However, by mid-day, the sun will be overhead and the harsh mid-day sunlight will make capturing good images of the ruins from the peak of Huayna Picchu difficult. This is why I recommend hiking up Huayna Picchu early in the morning and then having the rest of your allotted time available to touring and capturing the ruins themselves. 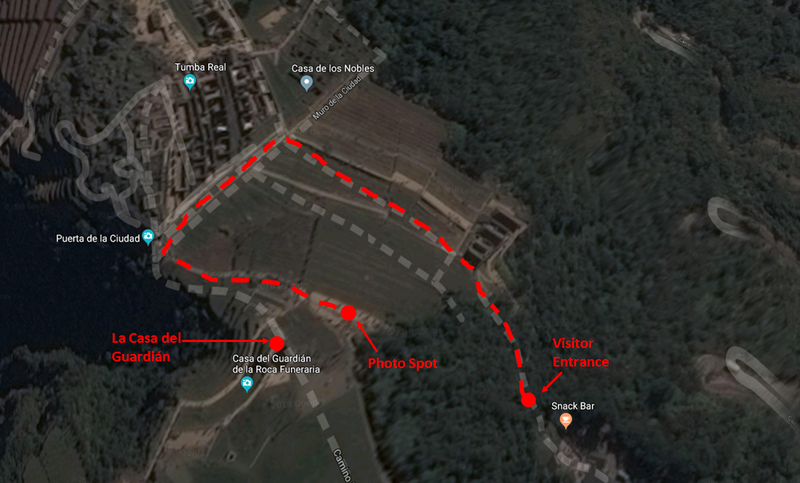 In case you are interested in some additional spots I recommend for photos, I have included a map below that details some of my favorite spots. If you have some additional spots you would recommend for readers, please feel free to leave your tips in the comments section. I am sure other travelers would greatly appreciate the tips! My favorite photography locations inside Machu Picchu. My brother Mitch and his bag of gear as we climb Huayna Picchu. When you visit Machu Picchu, you are going to want to make sure you have the right gear with you to be able to take the best pictures of the site. However, you are also going to want to make sure you only have the gear that you will need because you will have to lug whatever gear you bring along with you on the paths and steep steps inside the ruins. Believe me when I say that you will feel every pound that you carry because of the altitude. To assist you in determining what equipment you will want to bring, and what you can leave behind, I have put together a list of essential photography equipment for photographing Machu Picchu that I outline below. You will want to balance quality versus weight here. I would suggest bringing your DSLR if you have one because of the quality of shots that they take, but if you have a mirrorless camera that is probably ideal because they are much lighter and take high-quality shots. A wide angle lens is critical for capturing all of the wide shots in close quarters that you will be taking at Machu Picchu. Not only do they help you in photographing the ruins themselves as you take your tour, but a wide angle lens will allow you to capture the wide landscape shots that you want to take as well. I recommend a minimum focal length of 20-28mm for full frame cameras and a 10-22mm minimum focal length of crop sensor cameras (depending on your crop sensor). You will want to make sure you have enough battery life to take shots, not only while you are at Machu Picchu, but on your journey along the way. For this reason, I would bring a few extra charged batteries in your bag when you make your trip. It can get really bright at mid-day at Machu Picchu, so you are going to want to have a way to protect against lens flaring. One of the best ways to do this is to have a quality lens hood for your lenses. Tripods are prohibited in Machu Picchu without the proper permit because they are considered “professional” photography gear, but you can bring in very small tripods such as the UBeesize 12 Inch Mini Tripod, Altura Photo Mini Tripod, and RetiCAM Tabletop Tripod. I would not attempt to bring in any tripod that is larger than these. Any bag that you bring into Machu Picchu will need to be smaller than 40x35x20cm, so plan accordingly when preparing for your trip. Bags that are larger than this will need to be checked at the entrance, along with any equipment that you can’t carry with you. I recommend the Lowepro Fastpack BP 150 AW II – A Travel-Ready Backpack. It is small enough to bring into the site, very lightweight, and is well designed to maximize storage space. Having a polarizing filter on your lens will be extremely helpful when shooting landscape shots at Machu Picchu. I kept mine on my wide angle lens the entire time I was at the site. Any additional equipment that you bring will need to fit inside your bag and you will have to carry its weight around with you while you visit, so make sure you choose your gear wisely. Below are some optional pieces of gear you might want to consider bringing. Zoom lens (200-300mm maximum focal length). A wide angle lens will be far more valuable at Machu Picchu, but you may want to photograph wildlife or other subjects that require more reach. Battery Grip. Having a battery grip will allow you to go longer without having to change batteries (as most hold two at a time), and they also make taking portrait shots much easier because of the more convenient shutter button location. Light meter. Having a light meter can be helpful when trying to adjust to the ever-changing light conditions you will find at Machu Picchu. Wonderful and informative post! I’m still learning how to use my polarizing filter effectively. I love the tips! Thank you for the kind words Matthew!! Glad you found the article helpful. Thanks for reading!! What a great and informative article. You have some great shots of Machu Pichu here, and some great tips on how to get them. Thanks for the advice. Thank you so much for the kind words Jeff! Thanks for reading! Oh wow this was so wonderful and helpful! Thank you, your experience really shows!